September - The ninth month of the year in our Gregorian calendar and with it arrives the Autumn equinox and the first glimpses of the new season. 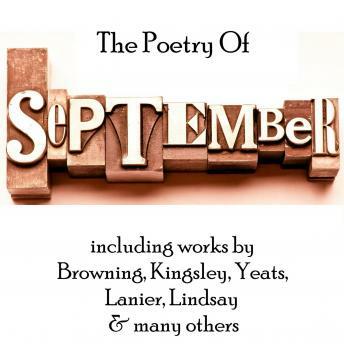 There is much for out Poets including Browning, Kingsley, Yeats, Lanier and Lindsay to say and write about. Among our readers are Richard Mitchley and Ghizela Rowe. The tracks are; September - An Introduction; September 1st 1802 By William Wordsworth; In September By Amy Levy; Sonnet XXL, Sacred To The Memory Of Edward Spedding Who Died September 3rd 1832 By Henry Alford; September 1918 By Amy Lowell; In September By Thomas MacDonagh; Lines Written On The 6th September By Thomas Gent; September 1815 By William Wordsworth; An Indian Summer Day On The Prairie By Vachel Lindsay; September By George Arnold; September By Helen Hunt Jackson; September By Carlos Wilcox; A Calendar Of Sonnets By September By Helen Hunt Jackson; Postscriptum, September 1913 By Thomas MacDonagh; Indian Summer By Sara Teasdale; September 1819 by William Wordsworth; Indian Summer By Henry Van Dyke; September 1913 By William Butler Yeats; September By Janet Hamilton; September By John Payne; Sonnet September 1922 By Ivor Gurney; 21st September 1870 By Charles Kingsley; Among The Rocks By Robert Browning; September Dark By James Whitcomb Riley; Ode To The West Wind By Shelley; Written In September 1804 By Christian Milne; The Golden Wedding Of Sterling And Sarah Lanier September 27th 1868 By Sidney Lanier; Written In London September 1802 By William Wordsworth; Late September By Amy Lowell; A September Night By George Marion McClellan; September Midnights By Sara Teasdale.